Udupi, March 18, 2018 (News18): Congress president Rahul Gandhi will be touring parts of coastal and Malnad Karnataka on Tuesday and Wednesday. After a good public response to his earlier tour of Hyderabad-Karnataka and Mumbai-Karnataka regions, the party chief is touring the communally sensitive, BJP stronghold of the state. But some Congress leaders from Udupi are not enthusiastic about his visit. According to local Congress leaders, Udupi district in-charge minister and MLA Pramod Madhwaraj is not interested in hosting the party leader and has conveyed the same to state Congress leaders. Speaking to media, a party leader said, "Pramod Madhwaraj may join the BJP. It is almost confirmed. Only a miracle can stop him from quitting the party. That’s why he is least bothered about hosting our national president". Another Congress leader said Shobha Karandlaje, the BJP MP from Udupi Chikmagalur, has persuaded Pramod to “hold the lotus (BJP’s symbol)" in hand in upcoming Assembly elections. It is not just Pramod Madhvaraj who is disinterested in Rahul Gandhi’s visit. Senior Congress MLA from Baindoor and chairman of KSRTC Gopal Poojary has also reportedly told the state Congress leaders that he won’t be able to host the party president in Kundapura and Baindoor, both in Udupi district. When contacted, Pramod Madhvaraj said he did not want to respond to the “rumours”. Gopal Poojary said Rahul Gandhi was not visiting Kundapura and Udupi due to paucity of time. Countering both, a senior leader from the coast said, "Udupi is a temple town and district headquarters. Is it not surprising that Rahul Gandhi is not visiting Udupi? He is visiting places like Ermal and Kaup on the border of Udupi and Dakshina Kannada districts, but not travelling further. What does it mean?" Pramod is the son of one-time Congress veteran from Udupi Manorama Madhvaraj. She had quit the party to successfully contest in the 2004 Lok Sabha elections on a BJP ticket. But Pramod had remained in the Congress and had lost two Assembly polls on Congress ticket. Two years ago, Siddaramaiah had inducted him into his Cabinet as Sports and Youth Affairs Minister. Recently, his name figured in an alleged bank scam. According to reports, he had allegedly taken a loan of around Rs 200 crore by pledging a land worth just Rs 3 crore. Rahul Gandhi will be addressing a public meeting in Mangalore on Tuesday evening. He will also participate in a few corner meetings of party workers in the district. Dakshina Kannada district is known as a Hindutva laboratory and the BJP alleges that over two dozen RSS workers have been killed in this area in the five-year Congress rule. The Congress disputes the figures and blames the BJP for the communal polarisation. Several Muslims have also been killed in and around Mangalore over a period of time. Rahul Gandhi’s visit to the district will be keenly watched by the RSS and the BJP. After Tuesday’s coastal Karnataka tour, Rahul Gandhi will be participating in election programmes in neighbouring hilly districts of Chikmagalur and Hassan, known as the ‘coffee bowls’ of India. Gandhi will be visiting the Sringeri Sharada Peetham near Chikmagalur, one of the four peethas established by Adi Shankaracharya 1,300 years ago. The Congress president will meet the seer of the peetha, Bharathi Theertha Swamy, and will interact with the students at Rajiv Gandhi Sanskrit University in Sringeri. Both his father Rajiv Gandhi and grandmother Indira Gandhi were devotees of Sringeri mutt. Indira Gandhi had re-entered Parliament from Chikmagalur in 1978 after her defeat in the 1977 General Elections, held after the Emergency era. 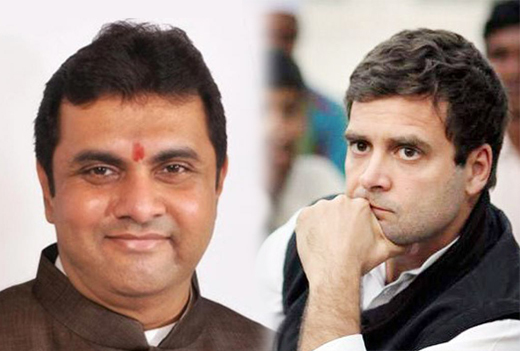 Rahul Gandhi will also address a public meeting at JD(S) supremo and former prime minister HD Deve Gowda’s family fiefdom Hassan before returning to New Delhi on Wednesday evening.